If you're a good salesperson, you can sell anything to anyone once. But it will be your approach to customer service that determines whether or not you’ll ever be able to sell that person anything else. 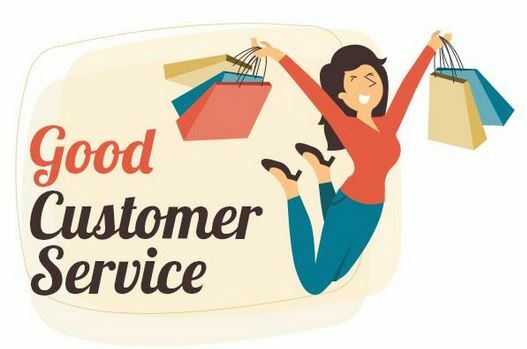 The essence of good customer service is forming a relationship with customers – a relationship that the individual customer feels that he would like to pursue. The first rule of good customer service is that your business phone needs to be answered. Get call forwarding. Or an answering service. Hire staff if you need to. But make sure that someone is picking up the phone when someone calls your business. (Notice I say "someone". People who call want to talk to a live person, not a fake "recorded robot".) And then read How to Answer the Phone Properly to make sure that customers calling your business are thrilled with the way the phone is answered at your business rather than put off. 2. Don't make promises unless you will keep them. This may well be the most important of all of these eight rules for good customer service. Not plan to keep the promises you make. Will keep them. Reliability is one of the keys to any good relationship, and good customer service is no exception. If you say to a customer, “Your new bedroom furniture will be delivered on Tuesday”, make sure it is delivered on Tuesday. Otherwise, don't say it. The same rule applies to client appointments, deadlines, etc.. Think before you give any promise and make them carefully - because nothing annoys customers more than a broken promise. Is there anything more exasperating than telling someone what you want or what your problem is and then discovering that that person hasn't been paying attention and needs to have it explained again? Not from a customer's point of view. Can the sales pitches and the product babble. If you're truly interested in providing the best customer service, let your customer talk and show him that you are listening by making the appropriate responses, such as summarizing what the customer has said and suggesting how to solve the problem. No one likes hearing complaints, and many of us have developed a reflex shrug, saying, "You can't please all the people all the time". Maybe not, but if you give the complaint your attention, you may be able to please this one person this one time - and position your business to reap the benefits of good customer service. Properly dealt with, complaints can become opportunities. They give you the chance to discover issues and correct them, thereby improving your customer service. Market research has found that customers who have complained about a product or service and had that complaint successfully dealt with are 70 percent likely to order from the vendor again. 5. Be helpful - even if there's no immediate profit in it. The shopkeeper made nothing during our exchange in his store. But I'll certainly be taking my business to him in the future and who knows how many other customers will be visiting him because I've told them how well he treated me? To provide good customer service, keep your eye on the customer, not on the profit. If you have staff, train them to be always helpful, courteous, and knowledgeable. Do it yourself or hire someone to train them. Talk to your staff about good customer service and what it is (and isn't) regularly. (Good Customer Service: How to Help a Customer explains the basics of ensuring positive staff-customer interactions.) Most importantly, give every member of your staff enough information and power to make those small customer-pleasing decisions, so he never has to say, "I don't know, but so-and-so will be back at..."
7. Take the extra step. For instance, if someone walks into your store and asks you to help them find something, don't just say, "It's in Aisle 3". Add the extra step; say, "Let me show you" and lead the customer to the item. Better yet, wait and see if he has questions about it, or further needs. Whatever the extra step may be, if you want to provide good customer service, take it. They may not say so to you, but people notice when people make an extra effort and will tell other people. And that good word of mouth will win you more customers. Whether it's a coupon for a future discount, additional information on how to use the product, or a genuine smile, people love to get more than they thought they were getting. And don’t think that a gesture has to be large to be effective. A local art framer attaches a package of picture hangers to every picture he frames. A small thing, but so appreciated. Think about your product or service and find something extra that you can offer to customers. If you apply these eight simple rules consistently, your business will become known for its good customer service. And the best part? Over time good customer service will bring in more new customers than promotions and price slashing ever did!